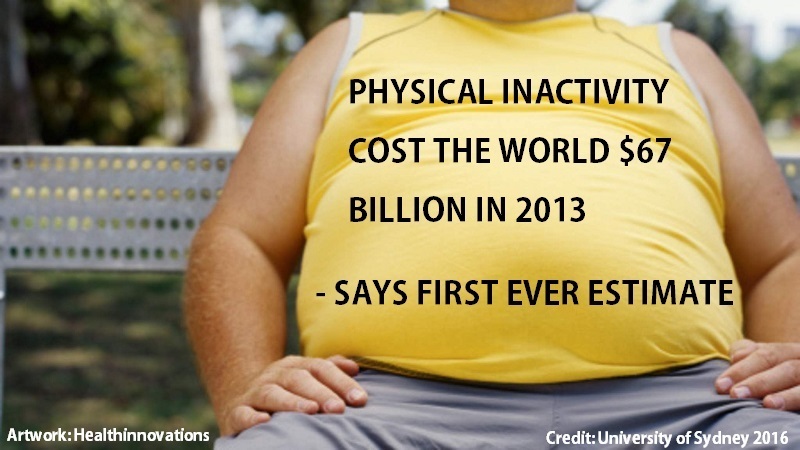 Physical inactivity cost the world $67 billion in 2013 says first ever estimate. The pandemic of physical inactivity is associated with a range of chronic diseases and early deaths. Despite the well documented disease burden, the economic burden of physical inactivity remains unquantified at the global level. A better understanding of the economic burden could help to inform resource prioritisation and motivate efforts to increase levels of physical activity worldwide. Now, a study from researchers at the University of Sydney reveals in 2013, physical inactivity cost $67.5 billion USD globally in healthcare expenditure and lost productivity, revealing the enormous economic burden of an increasingly sedentary world. The team state that their findings provide the first-ever global estimate of the financial cost of physical inactivity by examining the direct health costs, productivity losses, and disability-adjusted life years (DALYs) for five major non-communicable diseases attributable to inactivity. The study is published in The Lancet. Previous studies show that physical inactivity is recognised as a global pandemic that leads to diseases and early deaths, as well as imposing a major burden to the economy. The current study utilised data from 142 countries, representing 93.2% of the world’s population to estimate that in 2013 the effect of physical inactivity cost the world economy more than $67.5 billion USD. The current study analysed direct health costs, productivity losses, and DALYs attributable to physical inactivity for 142 countries. Direct health costs and DALYs were estimated for coronary heart disease, stroke, type 2 diabetes, breast cancer, and colon cancer attributable to physical inactivity. Results show that physical inactivity cost the global economy $67.8 billion USD in 2013, with Australia footing a bill of more than AUD $805 million. Data findings show that at a global and individual country level, these figures are likely to be an underestimate of the real cost due to the lack of data in many countries. The group state that, conservatively estimated, physical inactivity cost healthcare systems international $53·8 billion USD worldwide in 2013, of which $31·2 billion was paid by the public sector, $12·9 billion USD by the private sector, and $9·7 billion USD by the number of households. Result show that physical inactivity related deaths contributed to $13·7 billion USD in productivity losses, with physical inactivity responsible for 13·4 million USD in DALYs worldwide. Data findings show that high-income countries bear a larger proportion of economic burden, whereas low-to-middle income countries have a larger proportion of the disease burden. The researchers note, generally, poorer countries don’t have their health needs met due to less developed health and economic systems, ultimately, paying the most in terms of premature death and disease. They conclude that as these countries develop economically, so will the consequent economic burden if the pandemic of physical inactivity spreads as expected. The team surmise that their study provides a better understanding of the true burden of the pandemic of physical inactivity, and provides useful information for policy making, funding allocation and benchmarking in the global prevention of non-communicable diseases. They go on to add that their findings provide further justification to prioritise promotion of regular physical activity worldwide as part of a comprehensive strategy. For the future, the researchers state that globally, the economic burden of physical inactivity is projected to increase, particularly in low-to-middle income countries. Really impressed about the.cost estimated. What would be the saving cost if we begin world.wide schools campaigne of exercises and nutritional class to prevent overweight ?